Guest: 具志堅 ティナ (Gushiken Tina aka Tina Manning) - Actress. Higashino Koji mentions her having been to a foreign school and the different ways in which people greet each other there compared to Japan. He then asks her to demonstrate one such way with a kiss, she concedes to a friendly hug instead. Cue the rest of the cast trying to get one too, though of course Downtown won't let Housei get one so easily! 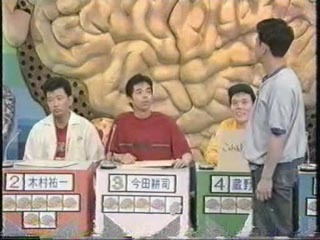 Kimura Yuichi is the chosen member this time for the others to guess the answer of. Everything finishes off with a big rock-paper-scissors battle.